F & L RECORDS - Founded in March 1958. The label was owned by Frank Floyd and Larry Kennon. Only one record is recorded on this label, on side-A Frank Floyd knocks out brilliant rolling country blues cut "Rock A Little Baby", which features hot acoustic guitar, washboard rhythm and upright bass, and on side-B Larry Kennon wants to make some "Monkey Love" (F-100). 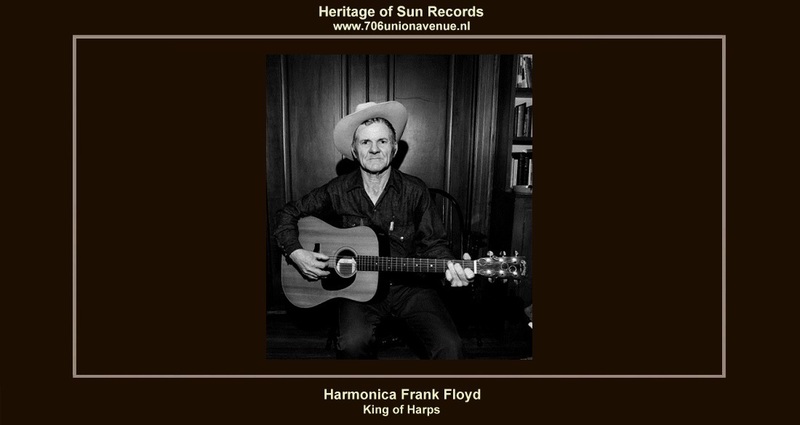 Frank Floyd, known as "Harmonica Frank" had recorded on the Sun label in 1954, ''The Great Medical Menagerist'' b/w ''Rockin' Chair Daddy'' Sun 205. HARMONICA FRANK - KING OF HARPS - Frank Floyd, born to Reuben Brewster Floyd and Estella Miles in Toccopola, Pontotoc County, Mississippi, on October 11, 1908, was nicknamed "Shak" (he was never christened with a formal name). Also known as "Rambling King" and "The Silly Kid". Frank Floyd was one of 3 children and he raised and worked on the farm from his childhood, and he taught himself the harmonica at 10 years of age. He spent his earliest years with his grandparents in rural Arkansas, left home in 1922, and rambled throughout much of the Depression. He left home in 1922 and adopted the name Frank Floyd. Frank joined a carnival in the early 1920s and played for nickels and dimes on street corners. Floyd was frequent and working as comedian, singing harmonicist in carnivals, amateur shows, on the streets in honky tonk bars, and parks through the South and Southwest circa 1922 through the end of the 1920s. He was influenced by DeFord Bailey, Blind Lemon Jefferson, Palmer McAbee and Jimmy Rodgers, Harmonica Frank worked with the Cole Brothers Carnival through the South in the late 1920s and toured with the West Motorized Show through the South. Only Chris Strachwitz, who runs the Blues Classic label, and Down Home Music, ever paid him any money for his music. He told blues researcher Steve LaVere, who rediscovered him in 1972: "I spent a lot of time listening to the darkies in days gone by singing in the cottonfield down South and I picket up their songs and speech. That is the reason people think I am a coloured man, But I really am white. I never played with no blacks, but I was a fan of Blind Lemon Jefferson and Lonnie Johnson".